Stanbridge College has partnered with Fordham University through the Interdisciplinary Collaborative on Health, Environment and Human Performance created by Debra McPhee, Ph.D., Dean of the Graduate School of Social Service (GSS) at Fordham University. The exploratory relationship begins with an initial pilot project called the LongDuration Space Exploration Behavioral Readiness Consortium for the manned mission to Mars. 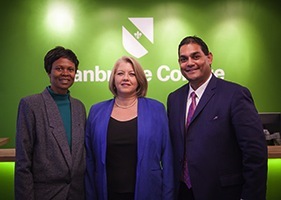 Right to left: Dr. Yvonne Cagle, Dr. Debra McPhee, and Mr. Yasith Weerasuriya initiating the partnership between Stanbridge College and Fordham University. The Consortium is overseen by Yvonne Cagle, M.D., Physician, Space and Life Science Directorate at National Aeronautics and Space Administration (NASA), and visiting professor at Fordham University and Stanbridge College and Dr. McPhee. Stanbridge College Occupational and Physical Therapy programs are working with the Collaborative to assist in the research. Dr. Cripe, NeuroEngineer, lead a special presentation and discussion for students and staff in the Stanbridge College Occupational Therapy program on the development of neurobehavioral models for crew members for the mission to Mars. The partnership officially launched in April when Dr. McPhee, Dr. Cagle, and other members of the Collaborative including NeuroEngineer, Dr. Curtis Cripe, and Forensic Psychologist, Dr. Sonnee Weedn, visited Stanbridge College to meet with the administration. Dr. Cripe led a special presentation and discussion for students and staff in the Stanbridge College Occupational Therapy program on the development of neurobehavioral models for crewmembers for the mission to Mars. Stanbridge College hosted a luncheon to celebrate the partnership where guests included the Honorable Matthew Harper of the 74th Assembly District, as well as representatives from the occupational and physical therapy employment communities in Southern California, and several Stanbridge College Occupational Therapy Assistant and Physical Therapist Assistant alumni. Founded in 1841 Fordham University is a private, nonprofit, coeducational research university distinguished by the Jesuit tradition and located in New York City. Fordham is composed of ten schools/ colleges, four of which are for undergraduates and six of which are for postgraduates. It enrolls approximately 15,000 students across three campuses inNew York State: Rose Hill in the Bronx, Lincoln Center in Manhattan, and Westchester in West Harrison. In addition to these campuses, the University supports a study abroad center in the United Kingdom and affiliate programs in China, Spain, and South Africa. Fordham awards the Bachelor of Arts, Bachelor of Science, and Bachelor of Fine Arts degrees, as well as various masters and doctoral degrees. Founded in 1996, Stanbridge College offers specialized degrees at the Master, Bachelor, and Associate levels in the fields of Healthcare and Information Technology. Stanbridge is based in Irvine, California with an annual enrollment of over 1,200 students. For each year from 2009 through 2014, Stanbridge has been named to the President’s Higher Education Community Service Honor Roll, the highest federal recognition a college or university can receive for its commitment to volunteering, service-learning, and civic engagement. Stanbridge College has received an award from Institutional Research & Evaluation, Inc., as one of America’s Best Technical Colleges for each year from 2009 through 2014. From 2013-2014, Stanbridge College OTA graduates achieved a 96% average annual NBCOT-COTA pass rate. From 2007-2014, its Vocational Nursing graduates have achieved a 91% average annual NCLEX-PN pass rate. Its Hemodialysis Technician students achieved a 95% two-year average annual CDC CHT exam pass rate. 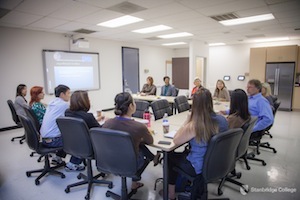 For more information, please visit www.stanbridge.edu or call (949) 794-9090.